Thyme for Cooking's Main Courses: Barbecued Pork, Ratatouille. 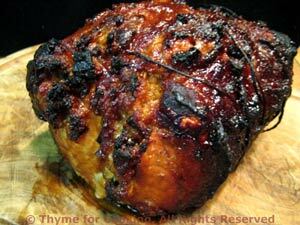 This is marinated for a few hours in a cross between a brine and a classic pork rib sauce. I stuffed it with mushrooms and ham and cooked it on the barbecue. After removing the pork from the marinade I boiled the marinade for 5 minutes, reducing it to use both as a basting sauce (some of it) and a dipping sauce (the rest). There is enough pork for two meals. Be sure to save any leftover sauce for the leftover pork! Mix all ingredients for marinade/barbecue sauce. Cut a lengthwise slit down the center of the pork loin almost all the way through. Leave about 1/4" (.5cm). You want to be able to open it like a book. Spread the pork out in a deep dish and pour the marinade over. Turn the pork to coat, cover and refrigerate. Finely chop mushrooms and Prosciutto. Mix mushrooms, Prosciutto and bread crumbs in a small bowl. Add 3 tbs of marinade and mix well. 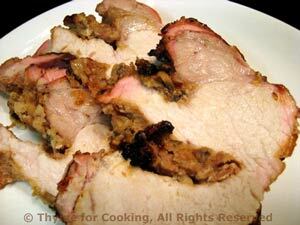 Remove pork from marinade, reserving marinade, and let drain a bit. Lay pork out with cut side up. Spread the stuffing on one side up to 1/4" from the edges. Fold the other side over and tie well with kitchen string: Cut five 10 inch lengths of string and wrap around pork and tie every 2 inches or so - making certain that you do one as close to each end as possible. Cook pork on barbecue grill for 45 - 60 minutes or until done, basting 3 or 4 times with the Barbecue Sauce. When done, slice and serve with more Barbecue Sauce on the side. Or: Could also be baked at 400F for 45 - 60 minutes or until done but you won't get the sugary crust. It is done when it's still slightly pink in the center - slice and peak or use a meat thermometer. An instant read meat thermometer is best for a nice, juicy roast. Cook it to an internal temperature of 145F (62C) See techniques. Put reserved marinade in a small saucepan and bring to a boil. Boil for 5 minutes. Remove 1/3 cup to use as a basting sauce and reserve the rest to use as a dipping sauce for this meal and with the leftover pork. 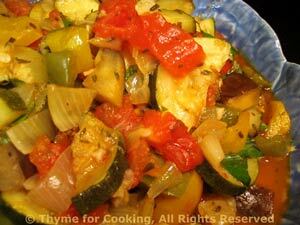 There are as many recipes for Ratatouille as there are cooks who make it. And as many methods. Some call for cooking it all together in one pot for hours, some in separate pots for 30 minutes, some for sautéing first, others for roasting. This is my way, I think sautéing the vegetables first highlights their individual flavors. The one universal is the list of vegetables (although not their ratio) and stirring in fresh basil at the end! Roughly chop the onions and peppers. Slice the zucchini in half the long way, then in 1/4" slices. Peel and roughly chop the tomato. Heat 1 tbs oil in large skillet over medium high heat. Add the onions and sauté until starting to brown. Add garlic and sauté for a minute or two longer. Put onions and garlic (and cooking olive oil) into a large pot. Put the pot (with the onions) on low heat. Return the skillet to heat and add 1 tbs oil. Add peppers and sauté until starting to brown and blister. Put peppers and olive oil on top of onions. Return the skillet to heat and add 1 tbs oil. Add zucchini and sauté until starting to brown and soften. Put zucchini and olive oil on top of peppers. Return the skillet to heat and add 1 tbs oil. Add eggplant and sauté until starting to brown on all sides. Put eggplant and olive oil on top of zucchini. Put bay and thyme on top of eggplant. Put tomatoes on top of herbs. At this point you can add a bit of salt and pepper if you like. Give it a gentle stir or two, cover and increase heat slightly until you hear it simmering. Reduce heat and simmer for 45 minutes. Stir it every once in awhile. When ready to serve, remove from heat, tear the basil leaves, stir in and serve. Note: It took me about 35 minutes to do the chopping and sauteing; everything was tender and well done in 30 minutes but I let it simmer for 45. Note 2: Peel tomatoes by blanching in boiling water for 30 seconds first. The peels slip off easily. Chicken breasts are a favorite on the grill but be careful not to overcook or they tend to dry out. We prefer to slice them thinly, at an angle, to serve rather than leaving the breast whole, but that, of course is optional! In small bowl whisk together oil, juice, marmalade, garlic, tarragon and ginger. Put chicken in shallow glass baking dish and pour marinade over. Let marinate 15 - 30 minutes. 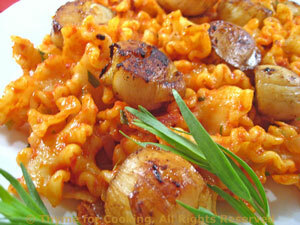 Cook on barbecue grill 15 - 20 minutes or on baking sheet in oven (400F) for 25 - 30 minutes or until done. When done (knife poked in and juices run clear) remove from heat, slice and serve. You could make smaller burgers, but we like this big one. Cut into wedges, with cheese oozing out of the center.... This one is filled with mushrooms, olives and Gruyère. Cut Prosciutto into thin strips. Oil grill basket, mesh pan or baking sheet. Divide beef in half. On plates or waxed paper pat each half into a thin patty, 8 or 9 inches (20 - 23cm) in diameter. 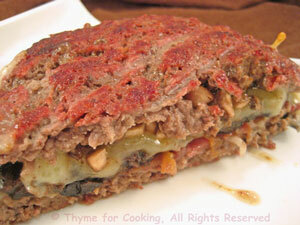 Spread mushrooms, olives and Prosciutto over 1 patty to within 1/2 inch of edge. Flatten the second patty a bit more and carefully put it on top and work the edges together with your fingers to seal. Slide or tip it on to the grill basket and close basket. If you don't use a basket you'll need a plate or baking sheet to help turn it. If using the barbecue, grill for 8 - 10 minutes over medium-high heat, carefully turn and grill another 8 - 10 or until done. If using oven, bake at 400F for 35 - 40 minutes or until done. Hint: When cheese starts oozing out of the edge I consider it done. Remove to platter, cut into wedges and serve. 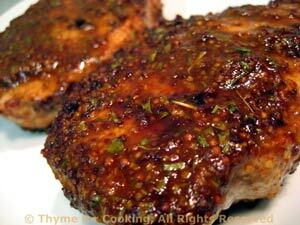 Pork chops with a kick, marinated and cooked on the barbecue grill. If you want them hotter, more 'devilish' you could add a drop or 2 of Tabasco or other hot sauce. 2 tbs orange juice Substitute 1 tbs orange marmalade or 1 tbs lemon juice with 1 tbs sugar or 2 tbs white wine. Mix all ingredients for marinade and spoon on chops. Let marinate for 10 - 15 minutes. Cook on barbecue for 4 - 7 minutes a side or until done. Should be slightly pink in center when done - take a peak (techniques). Or fry in nonstick skillet over medium-high heat the same amount of time.